has been updated and expanded into a new 4th edition. 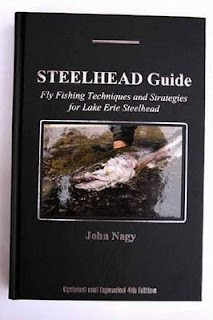 John Nagy's Steelhead Guide has long been considered the bible for steelheader's "chasing" chrome on Lake Erie's tributary streams as well as very useful to steelhead fisherman in other areas of the Great Lakes. Expanded from 257 to 320 pages (including color insert), a major addition to the new 4th edition is 119 new and innovative steelhead fly patterns (replacing all previous 3rd edition patterns) contributed by guides by guides, fly tyers and steelhead fly fisherman from all over the Lake Erie region (44 tyers total). 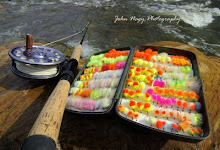 In addition to steelhead egg patterns, nymphs, soft hackles, streamers, wooly buggers, sculpins, leeches and spey flies, 28 hot tube flies (both conventional and Scandinavian tube designs) are also included. It also includes a new Deadly Dozen list, additional Steelheader's Tips and a humorous "Steelheader's Quiz". 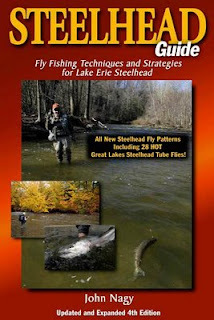 An exciting new and detailed chapter on tube flies for Great Lakes steelhead discussing their history, benefits, construction and use has been added as well as tube tying materials sources, updated steelhead equipment recommendations and the latest Lake Erie region fishery news. It also includes updated guide, tackle shop, lodging and dining lists, steelhead related web sites as well as current smolt stocking lists and recent fishery data and reports. 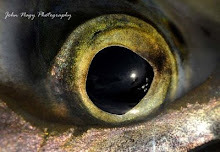 New photos have been added to Steelhead Guide including an expanded color insert section of the new steelhead fly patterns as well as steelhead photography taken in the Lake Erie region. Some of the previous 3rd edition text (carried over into the new 4th edition) has also been revised and/or clarified as well. 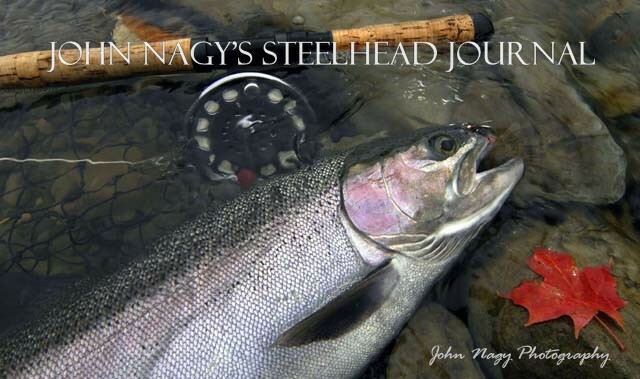 Both soft and hard cover editions (autographed copies) now include a custom steelhead fly tied by the author John Nagy when purchased through this website! A limited number of signed hard covers are also available. These hard covers are handsomely done in soft, black Matador leather cover strock (matte finish) with silver foil stamping including a stunning steelhead color photograph. The photograph (glossy finish) is individually hand-set on the front in a deboss panel with a silver foil border. Pricing for hard cover 4th edition is $42.95 plus $5.00 shipping per order (PA residents add 7% state sales tax of $3.36). Follow payment instructions above for soft cover. John Nagy's Steelhead Guide, Fly Fishing Techniques and Strategies for Lake Erie Steelhead (Updated and Expanded 4th edition) is now available in the Amazon Kindle eBook version. It is readable on a Kindle reading device and also any other device (phone, tablet, computer) by downloading a free Kindle app from Amazon.